Today, we’re happy to release a very large icon set: the freebie contains 500 icons in four editable variants: outlined, solid, webby and flat, covering all sorts of various categories. The icons allow you to customize the stroke width and style, not to mention that you can change the color of the elements. They’re carefully crafted on a 60px grid which gives each icon consistency and crispness on all displays. Smashicons come in several styles. The AI and Sketch formats come in four styles: outline for mobile use; solid for hover state; webby for web; and flat for any creative project. The PSD format comes in two styles: outline for mobile use, and solid for hover states. Today, we’re happy to release a very large icon set: the freebie contains 500 icons in four editable variants: outlined, solid, webby and flat, covering all sorts of various categories. The icons allow you to customize the stroke width and style, not to mention that you can change the color of the elements. They’re carefully crafted on a 60px grid which gives each icon consistency and crispness on all displays. Smashicons come in several styles. The AI and Sketch formats come in four styles: outline for mobile use; solid for hover state; webby for web; and flat for any creative project. The PSD format comes in two styles: outline for mobile use, and solid for hover states. This icon set is licensed under a Creative Commons Attribution 4.0 International License. You can use the icons in commercial as well as personal projects, including software, online services, templates and themes. You may modify the size, color or shape of the icons. No attribution is required. However, reselling bundles or individual pictograms is not allowed. "Through Smashicons we wanted to translate profound thoughts into icons and give designers as well as developers the possibility to get straight to work when it comes to implementing icons in their projects. 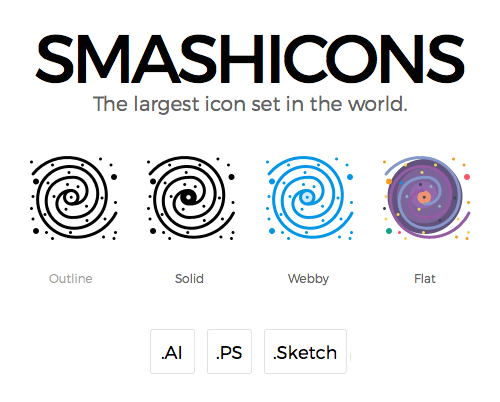 We tailored Smashicons to be as non-intrusive as possible for our 14,000 icons, but also creating the icon set on all major design plattforms: Illustrator, Photoshop (outline and solid) and Sketch. This means that using icons in your creative projects has never been easier." Huge thanks to Oliver for releasing the icons — we sincerely appreciate your time and effort! Keep up the brilliant work!